Stems: Erect, simple, few to several in clump, sparsely soft-hairy. Leaves: Mostly basal, leaves of main stem alternate; lanceolate to narrowly oblong, 1.6 to 6 inches long, 1/3 to 1 inch wide, pinnately-cleft, fern-like in appearance; segments oblong to ovate, scalloped; lower leaves on stalks often longer than blade; upper leaves progressively reduced, short-stalked to nearly sessile. Inflorescences: Spike, solitary, dense, 1.2 to 2 inches in flower, to 8 inches in fruit; bracts leaf-like, oblanceolate, scalloped to toothed. Flowers: Calyces about 1/3 inch long; lobes 2, short, united behind, separated by short cleft above and deeper cleft below; corolla strongly 2-lipped, 3/4 to 1 inch long, pale yellow, sometimes tinged purplish or reddish, rarely completely purple; upper lip helmet-shaped, 1/2 to 3/5 inch long, 2 slender teeth just below tip; lower lip 3-lobed, 1/4 to 2/5 inch long; lobes widely spreading, lateral 2 rounded, longer than mid-lobe; stamens 4, arranged in 2 sets. Fruits: Capsule, asymmetrical, lance-oblong, 2/5 to 3/5 inch long, tip scarcely beaked; seeds numerous. Habitat: Moist open prairies, upland woods, and slopes bordering streams; sandy and acidic soils. Toxicity: Thought by some to be posinous to sheep. However, no cases of toxicity have been recorded in livestock. Uses: Native Americans cooked the stems and leaves for food and mixed the roots with oats to fatten their horses. Medicinally, an infusion of the roots was taken for stomach and heart disorders and sore throats. It was also rubbed on sores. A poultice of roots was applied to tumors and finely chopped root was added to food as a love charm. The plant was placed in dog beds under the belief that it would delouse the dogs. Comments: The name comes from Latin pediculus, "louse", alluding to the superstition that livestock who ate the plant would become invested with lice. Some believed that the plant bred lice. The seeds resembled lice and the scalloped leaves had the appearance of being invested by lice. In the past, it was used to keep lice away. 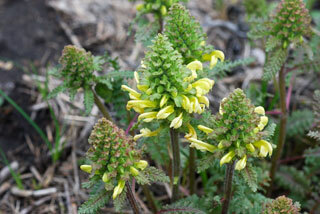 Wood betony is partially parasitic on the roots of other plants. The pollen is protected from precipitation by the hood-like upper lip.